I’m not one of those women above admitting that I enjoy a good glass of wine after I put the kids to bed. Shoot, some nights- that chilled glass is my saving grace. I’m also one of those cooks that likes to go off the grid, err off the recipe page, when trying something new. I know there’s many dishes enhanced, and only as good as, the wine that infuses them. 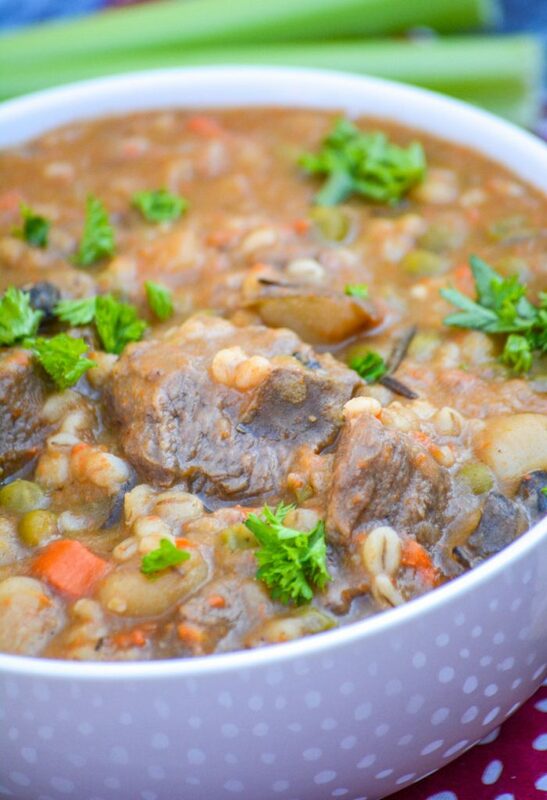 Although it never occurred to me that the beef & barley stew I’d grown up enjoying would be one of them. Until one fateful night. I’m running around like a chicken with my head cut off, trying to prep dinner. Trying to check homework. Listening to one kid read, another griping about girl problems. Being everywhere at once is hard work on my best day. I felt like a piece of taffy, stretched, stretched and stretched some more. Too thin, I popped the cork on my wine bottle early. Before supper kinda early. I figured it’d help me relax, especially combined with one of my other favorite past times- cooking, specifically cooking for my family. Then came the fateful moment when I had my glass held aloft, turned to talk to a kid, and the doorbell rang setting the dog off. In my haste, I accidentally added a healthy pour of red wine to the base for my stew. Oops. Talk about a delicious accident. Thanks for that UPS! I’ve never made a beef stew without it since. 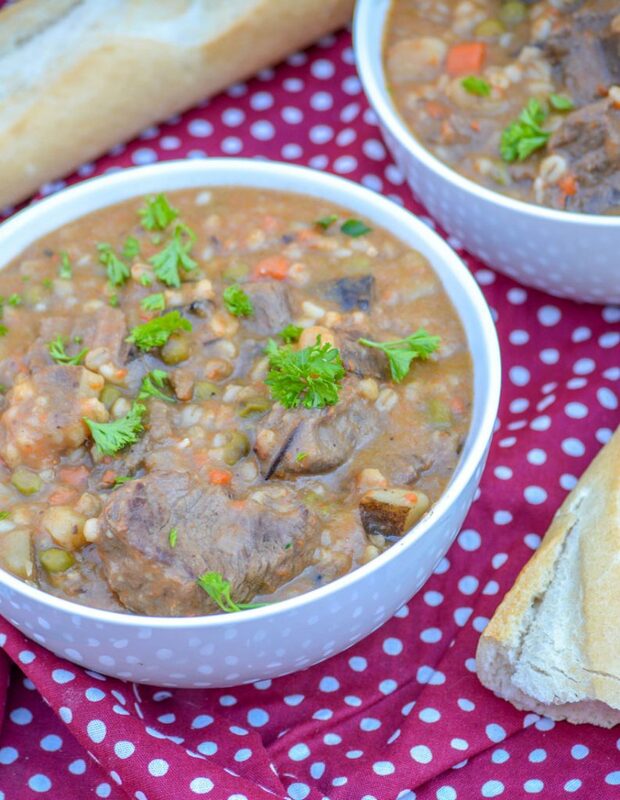 Stew beef and dried barley are always something I keep on hand in there respective spaces, obviously one in the deep freezer and the other in the pantry. They’re also the beginning ingredients to an incredibly delicious, hearty stew. 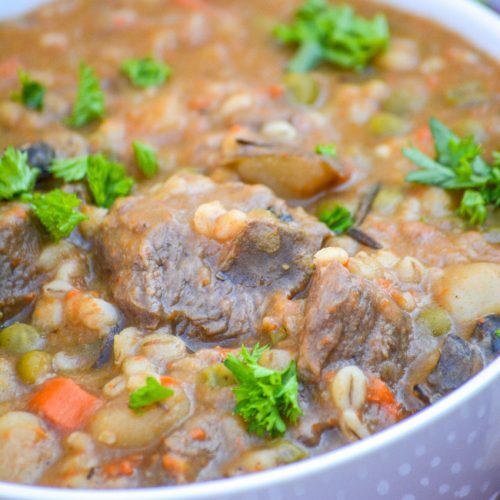 For me to consider a stew good, no matter how full of flavor, it’s got to be filling. 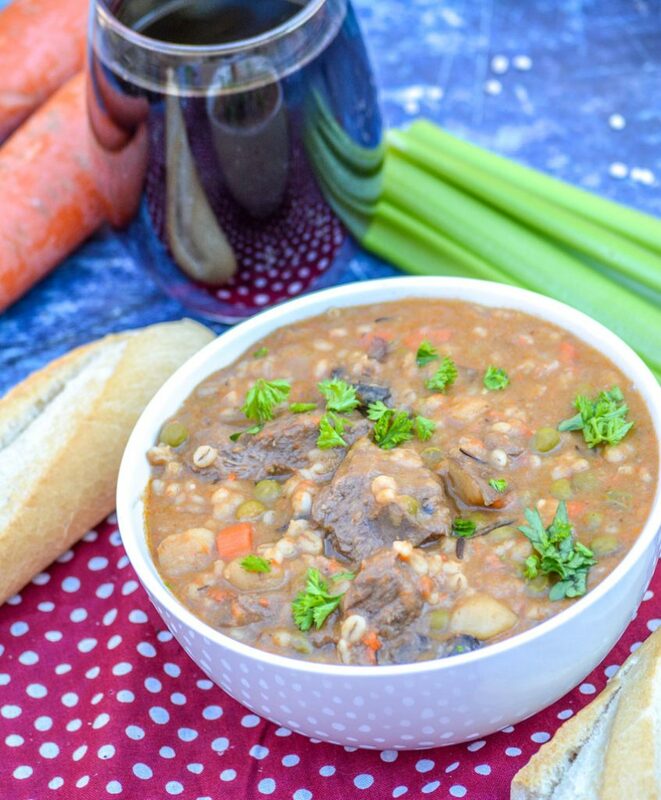 Chock full of chunks of stew beef, pearl barley, diced potatoes, chopped carrots, and onion- this soup delivers it all bathed in an unbelievably rich savory broth. Don’t be surprised if you find you’re tempted to lick the bowl clean. Even after a second helping. It’s just that good! I definitely had to remind two of the sons that we aren’t savages and don’t do such a thing. LOL. To save on time, and to make sure everything’s ready to move along in orderly fashion- I suggest having all your veggies prepped and chopped ahead of time. When doing this, it’s important to remember that pearl barley isn’t the quick cooking kind. It takes time. If you don’t want to end up with veggie mush, and want to retain their tender texture, go for larger than normal chopping & slicing. To begin, in a large bowl whisk together flour with salt & pepper. Add the meat to this mixture and toss it to evenly coat. Make sure you shake off any excess flour before adding it to the hot oil in your dutch oven over medium high heat. Fry the meat, stirring often, until it’s mostly cooked through. Pour the beef broth into the pot, stirring to de-glaze and get up any of those tasty brown bits stuck to the bottom. Stir the rest of the ingredients into the pot combining them. Mmm, smell that aroma starting to come off that pot? Just wait until all the flavors have truly married. Bring the pot to a boil, then reduce the stew to a simmer. Cook, simmering for 30-45 minutes, adding the peas in the last 10 minutes or so. While I say cover the pot, keep the lid cracked a bit so the mixture cooks down and thickens as it goes. If it’s not thick enough still, remove the lid completely and simmer for an additional 5 minutes. If the consistency is too thick for your liking, and you’re wanting more of a soup- thin it out with a little bit of extra beef broth. 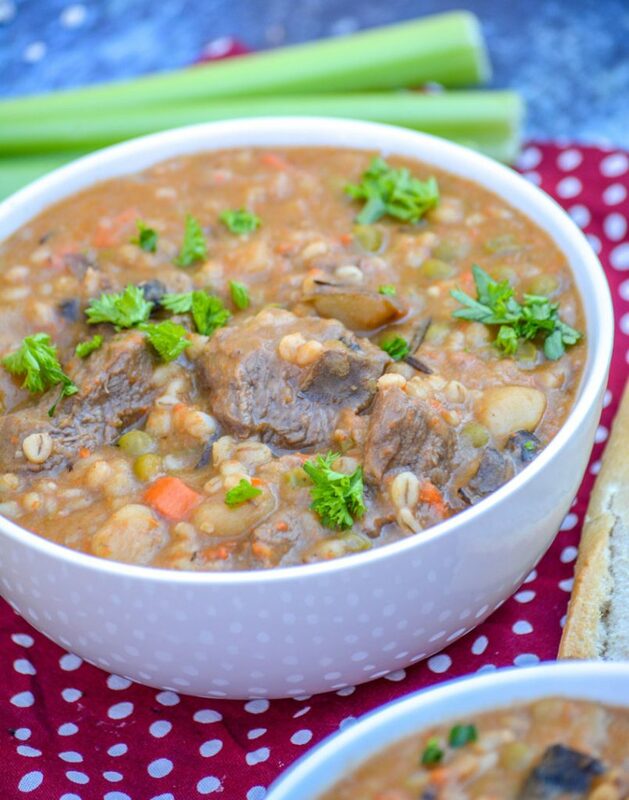 This beef & barley soup recipe was made to please and is very forgiving! 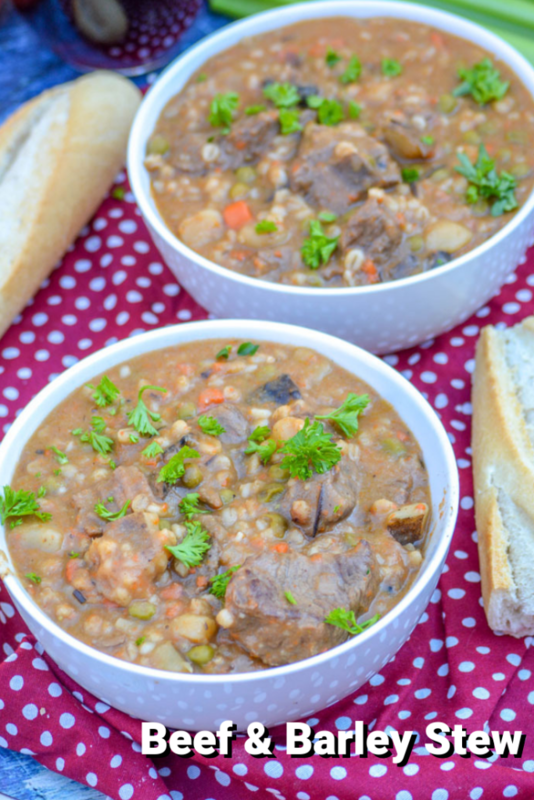 When has a bowl of hearty stew been a wrong way to go for a comforting meal in the Winter? Never, obviously. Add in a healthy pour of red wine to infuse the broth, and 3/4 cup of pearl barley though- and you’ve really upped the ante. 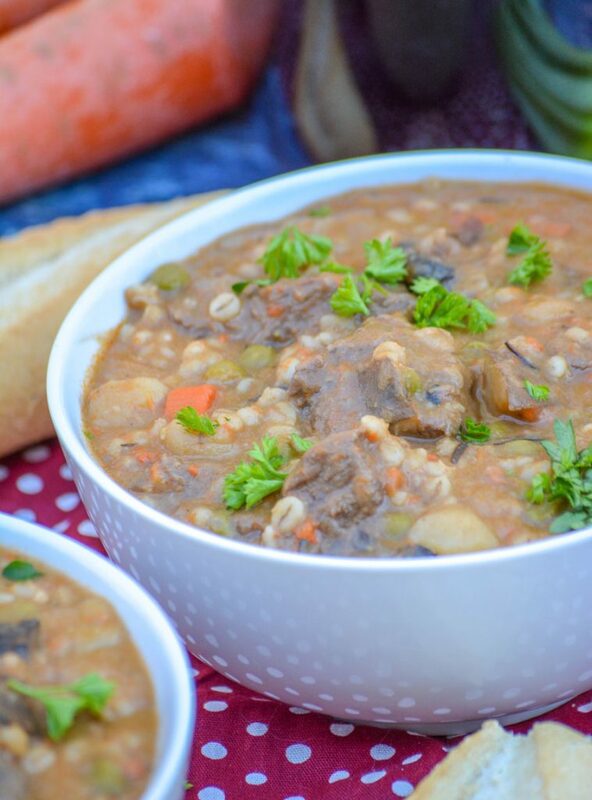 Fill up your family, or impress guests- this Beef & Barley Stew is guaranteed to do both! In a large mixing bowl, add the flour, salt, and pepper- stir with a fork to combine. Add the meat to the bowl, tossing to evenly coat. Heat the oil in a large dutch oven over medium high heat. Add the meat (making sure to shake off any excess flour) and stir, frying and continuing to stir until browned. Pour in the broth, stirring to deglaze the pot. Stir in the remaining ingredients. Bring the stew to a boil, then reduce the heat to medium low. Cover the bowl, and continue simmering the soup until it's thick and the barley's cooked, 30-45 minutes. Make sure to stir occasionally. to prevent sticking, and stir in the peas the last 10 minutes or so. Remove the lid the last five minutes, and let some of the moisture cook out if it's not thick enough yet. Remove the bay leaves from the pot. 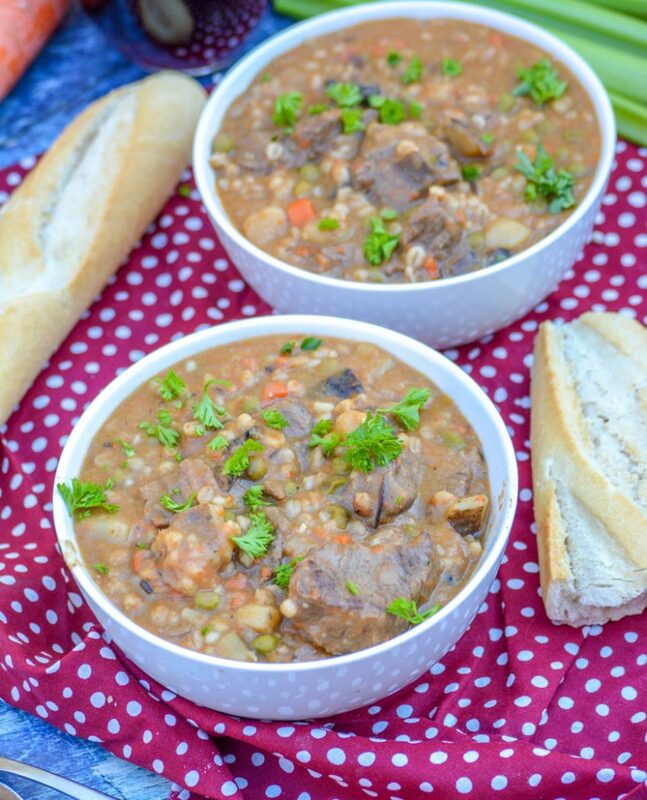 Ladle the soup into bowls, and serve with crusty bread. A happy mistake! And no one licks the bowl, here – if anyone is watching!! Thanks for sharing with us at Fiesta Friday! I made this recipe as directed with the exception of adding a couple stalks of celery, two tomatoes that were getting too ripe for salads and additional broth because the dish was really thick. I don’t think that 4 cups of broth is enough for 1 1/2 lbs of stew meat, the barley and potatoes. It was certainly filling and enjoyable and provided six generous servings. The main work is chopping the vegtables which, as suggested, was done in advance so they could be added quickly after the meat was browned. The wine added depth. All my family members enjoyed the end result which provided an interesting alternative to a traditional stew.